Or was it “In Like Flint”? How time dulls the memory. [Ed: And alcohol!] Anyway, yesterday something like a flint went into my bicycle tyre. So, today it was in with flint protection. Cycling may be great fun in our view but the ever-present risk of punctures due to pneumatic tyres occasionally rears its ugly head and bites us. My puncture repair using tired rubber solution at the pub in Bank yesterday seemed fine in that it got me the eight miles back to Guillaume successfully. However, this morning my rear tyre was once again as flat as a crèpe. There are various technological deployments marketed for protection against punctures. There are inner tubes pre-filled with supposedly hole-sealing slimy goop. (What kind of spell-checker doesn’t understand “goop”?) When you get a puncture, the leaking slimy goop, which, if the pictures are to be believed, is a tasteful radioactive green colour, is said to congeal in the hole thus sealing it. I didn’t fancy this approach because of the mess it might make of the inside of the tyre and because, if it didn’t seal, the slimy goop residue might make any subsequent old-fashioned repair très difficile. More appealing were bands of plastic armour which are to be inserted into the tyre to protect the inner tube. Though “guaranteed to work” (yeah, right), these armoured bands ought to enable a return to traditional puncture fixing should the need arise. Worth a try – we bought some. Incidentally, the bands are also radioactive green. What is it with vivid green and puncture protection? I’m always leery of items that say things like, “easy to fit”; if they have to make such a claim then it’s rarely true. Here we have the wheel off the bike with the tyre half-off (one bead off) the rim. Given a 26 inch wheel, one now has to juggle a loose-fitting 84 inch/7 feet/2+ metre (the ends overlap) band of plastic armour into the correct position within the tyre (inside the tread). One how has to support the wheel and keep the band in place while you finagle the inner tube’s valve back through the hole in the rim and tuck the inner tube back in place all around the wheel. The wheel, of course, is on its side, pivoting on the hub, and gravity is attempting to reposition the band every time you let go of it in order to free a hand to insert the inner tube. There are several jobs on this planet for which two hands do not come close to being adequate. Darwin please take note. Eventually, I juggled the protection in at the rate of one beer per bicycle. We had a very brief ride around the site just to make sure that all was back together correctly but the ol’ legs were feeling yesterday’s Bank excursion. Added to this, Francine has managed to damage one little piggy – the left one that went, “wee, wee, wee, all the way home” – by delivering poor Guillaume a swift drop-kick so her foot is bruised and sore. I left her soaking up the last rays of the afternoon while I took our favourite local wander down to Tiptoe to see what critters I could find. 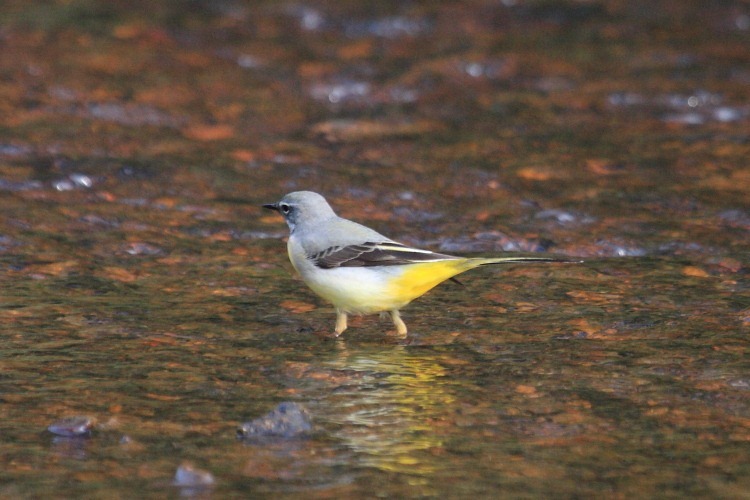 What do you know, the elusive Grey Wagtail (Motacilla cinerea) was dipping around on one of the stream’s shingle banks. Not the greatest of shots (Wellington boots in the stream, still relatively distant and cropped) but it shows the main distinguishing features: grey back, yellow rump).